The Iridescent Glint Beetle (オオガネモチ?, lit. : "Millionaire") is an enemy in Pikmin 2. They resemble golden, sparkling Iridescent Flint Beetles, but are much rarer. The majority of these creatures are found underground, with only two appearances above ground, both in the Awakening Wood. One is inside the pot to the right of the Figworts near the end of the constructable bridge, and the other is on the raised area near the entrance to Snagret Hole, to the left of the cave in a corner just before the ledge. This bug, when on land, drops three random-colored 5-pellets, and then two doses of ultra-spicy spray when hit with a Pikmin. Underground, the pellets are swapped for three doses of nectar. If the ultra-spicy spray has not been unlocked yet, it just drops more nectar (three doses) in place of the sprays. Some of the Glint Beetles that are underground drop treasure instead, and the Beetles in Challenge Mode always drop a Lustrous Element. Just like the Iridescent Flint Beetle, if it's killed whilst petrified, it will shatter instantly, leaving nothing behind. It can also be chased off cliffs in some caves. In comparison to the Flint Beetle, it stays above ground for less time, but, on average, stands still for slightly longer every time it stops moving. Glint Beetles move fast, making them difficult targets to pin, but at the same time, they have no offensive attributes, so an encounter with one can only end up as a chase. They hide underground, emerging only when approached. Much like the Iridescent Flint Beetle and the Doodlebug, the Glint Beetle can only be damaged by a direct throw to its back, which will cause it to flip over and drop nectar, or in some cases, a treasure. Purple Pikmin can hit the creature with much more ease, as the shock wave caused by the impact of one is enough to flip a Beetle over. Once a Glint Beetle has dropped all it was carrying, it will quickly scurry back underground. It will do the same thing if left undisturbed for too long. Simply throw Pikmin at the creature's back while it is standing still for a few seconds and repeat until you have reaped all its items. Try to predict the creature's movements, and throw your Pikmin one step ahead of it. Be accurate but quick, as the Glint Beetle will only remain active for so long. Purple Pikmin work especially well, and if you have a good number of them, you can throw quickly without worrying about accuracy at all. The Glint Beetle in Smash Run. This article or section is a short summary on the enemy in the Super Smash Bros. series. The Iridescent Glint Beetle appears in Super Smash Bros. for Nintendo 3DS and Wii U, as an enemy in each version's exclusive mode, as well as a trophy. On Smash Run on the 3DS, the Iridescent Glint Beetle, like in the actual game, is a harmless enemy, and will drop gold if the player hits it. The quantities increase the more the player hits it, just like in Pikmin 2. Similarly to the actual games, they move rather fast, and are hard to hit. Most enemies that fall off edges drop their spoils; the Glint Beetle will not do so. On Smash Tour on the Wii U version, it is an enemy that moves around the board, and bumping against it will make it drop some fighters for the player to use. The Iridescent Glint Beetle also appears as a spirit in Super Smash Bros. Ultimate. “A golden creature from Pikmin 2. They don't pop up very often at all, but when they do, they scuttle around speedily. When you flip them over, they drop nectar and rare treasures. In Smash Bros., they appear in Smash Tour, where you can bump into them to make them drop extra fighters! 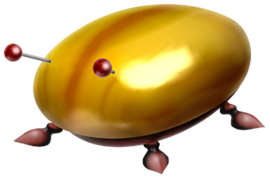 “A golden creature from Pikmin 2. They don't pop up very often at all, but when they do, they scuttle around speedily. When you flip them, they drop nectar and rare treasures. In this game, they appear in Smash Tour – bump into them to make them drop extra fighters you can take for your own. The creature's name is a pun on the Iridescent Flint Beetle's name. A glint is a shimmer of light, found on very shiny things. This creature's Japanese name, オオガネモチ? means "millionaire", referring to how gold is often associated with richness, but is also a pun on the Flint Beetle's name, given that the two share the ガネモチ? part. The creature's scientific name is Pilli auricus. The word Pilli means the same as in the Iridescent Flint Beetle's name, while auricus is related to aurum, the Latin word for gold. Internally, its name is wealthy, which is a translation of its Japanese name. In an earlier version of the game's script, inside the Japanese Disc, it is revealed that the enemy used to be called "Giant Flint Beetle". The reason for this is not known. Portuguese (NoE) Escaravelho Iridescente Iridescent Scarab Name taken from the Super Smash Bros. for Nintendo 3DS trophy. An Iridescent Glint Beetle on the Piklopedia. The creature's e-card, #22 (9th yellow card). Though they bury under ground after a while, this does not happen in the Piklopedia; same with Iridescent Flint Beetle and the Doodlebug. This page was last edited on February 19, 2019, at 13:26.